Click here to access the Wastewater Collection System Operator Certification Studybook. The Water Environment Federation (WEF; Alexandria, Va.) introduced a study resource to help wastewater collection system operators expand their knowledge and prepare to take certification exams. 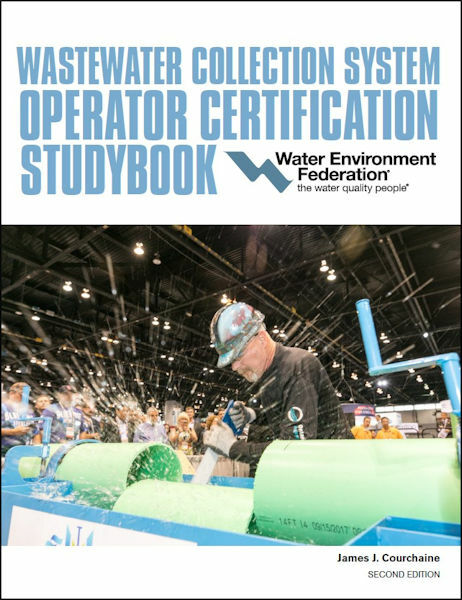 The second edition of the Wastewater Collection System Operator Certification Studybook provides in-depth information on the topics these professionals need to be familiar with and offers more than 500 study questions, more than 50 exercises and detailed solution sets, a comprehensive glossary, and a reference list. The studybook covers support systems, operations and maintenance, supervision and management, safety procedures, design and construction, and electrical pumps and motors. Questions in the book have been compiled, reviewed, field-tested, and edited during the last four decades by author James J. Courchaine. They are based on information provided in standard reference texts including those published by WEF and sample questions supplied by certification agencies in the U.S. and Canada. Initially released in 2005, the publication has been thoroughly updated and expanded. It is authored and peer-reviewed by leading water quality professionals. Purchase the book, available in print or as an e-book, at $59 for members and $89 for nonmembers. For more information, contact WEF staff member Karah DeMarco at Kdemarco@wef.org or 703-684-7211.